We had fun in NY and I figured it was about time I posted about it… it rained a lot, but that wasn’t really a problem. It actually meant we stepped into a few shops we might not have gone into, just because it was pouring so hard. One place we checked out when we happened to notice it, was the New York Doll Hospital on Lexington Ave- an amazing place. 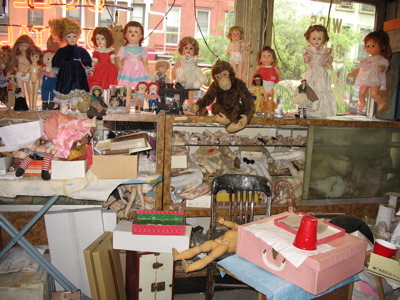 Piles and piles of dolls and doll parts. Lots of heads here. 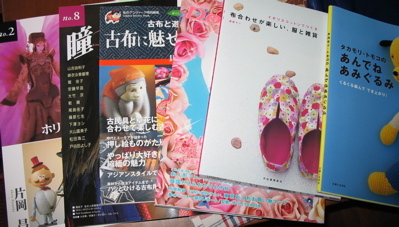 I went to all the Japanese Bookstores on the Crafting Japanese list. I had the most luck at Kinokuniya- it is a beautiful store and easy to find everything. I found some beautiful books on dolls, my favorite magazine “Dolly Dolly”, a book of puppets and puppetmakers from Japan. I ended up spending way too much money… my excuse was that it is cheaper then a trip to Japan. 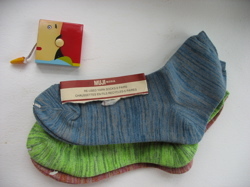 We went to the Museum of Modern Art Shop, one of my favorite places. I got these great socks. We went across the street to the American Folk Art Museum. There was a show of the sculptures of Nek Chand. Fantastic! On Sunday, we headed down to the lower east side. We went to Pearl River where I could have spent most of the day. So many fun items to look at. I bought some chinese brushes and some paper fans to ward off my current plague of hot flashes. 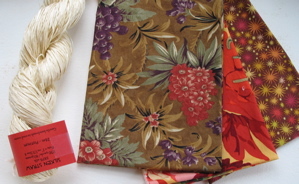 We then headed over to Purl- the yarn store and also the fabric store. They are just as great as everyone says. Since I absolutely don’t need any fabric or yarn, I had to control myself. I bought some white silk tape that I thought would be great for embroidery. I bought myself some fat quarters- just something to remember my trip. We went to Pearl Paint which is a total nostalgia trip for me- it was such a big deal to go there when I was young and in art school. We came home, totally worn out. Now I can start planning for the next trip. Hey, I used to live over Pearl Paint (the one in the Village)! I love that Dolly Dolly magazine, too. I always have to stop myself from buying them. You are so generous with all the info and websites. I love reading your blog it’s almost as if I’m there. American Folk Art Museum? *jealous* Thanks for mentioning them. I have looked at them in months and right now they have some John Brewster portraits up… including that of distant cousins. Fun, fun.